This week, January 21-25, we are hosting a Community Appreciation Week to help you kick start your 2019. It's so important to start the year off by getting your health on track. So, to help you do this, we are offering a New Patient Special for just $25! This will include a detailed spinal examination, any needed x-rays, and your first therapy treatment. We want to take a moment to walk through exactly what you can expect as a new patient with our practice. After this initial visit, we’ll take over and spend some quality time analyzing your case. This will help us devise a plan to help you reach your goals and maintain your health. We understand that health is by far our most important asset. And our team is committed to helping you reach your full potential and help you live the life you deserve. If you haven’t already, go ahead and click the button below to download our new patient forms. Click below to download our new patient forms for your first visit to our office. By printing and filling out the paperwork at home, you can save yourself time in the office during your first visit to Crist Chiropractic & Wellness. We will also provide them in the office if you forget. The forms will help us better understand your health and condition so we can provide you with the best and most personalized treatment possible. Don’t forget to bring your ID and insurance card (if you have one) to your initial appointment. We look forward to seeing you in our office! What can Chiropractic treat? What is Chiropractic? The skull protects the delicate tissues of the brain. The moving bones of the spine protect the vulnerable communication pathways of the spinal cord and nerve roots. If the nervous system is impaired, it can cause malfunction of the tissues and organs throughout the body. Doctors call this the Vertebral Subluxation Complex: Vertebral meaning the bones of the spine. Subluxation, meaning less than a total dislocation, and Complex meaning consisting of more than one part. A common interference to the nervous system is the 24 moving bones of the spinal column. A loss of normal motion or position of these bones can irritate or impair the function of the nervous system. This can disrupt the transmission of controlling nerve impulses and produce back or spinal pain. With improved spinal function there is often improved nervous system function. Your chiropractor can help remove interferences that may be impairing normal health. Since the primary focus of your care is improved nervous system function, chiropractic can have a positive effect on many health conditions not normally thought of as “back” problems or back pain. Helping to restore proper spinal biomechancis and improved nervous system function begins with a case history. This gives the doctor a background about your health, such as surgeries, accidents, the onset of your condition and other detail affecting your current health. Usually the doctor’s hands or a specially designed instrument delivers a brief and highly-accurate thrust. Some adjusting methods are quick, whereas others require a slow and constant pressure. Since a chiropractic adjustment is a specific force applied in a specific direction, to a specific final joint, it is virtually impossible to adjust oneself. It is possible to turn or bend or twist in certain ways to create a “popping” sound, like the sound that sometimes accompanies a chiropractic adjustment. Unfortunately, this type of joint manipulation is usually counterproductive, often making an already unstable area of the spine even more unsteady. Adjusting the spine is not for amateurs! The best way to enjoy healthful benefits of chiropractic is to receive adjustments from a Doctor of Chiropractic. Even your doctor must seek out the services of another colleague to help restore and maintain proper spinal function. While there aren’t any shortcuts to speed your body’s natural healing process, there’s a lot you can do to give yourself the best chance of a quick recovery. Learn proper sitting and lifting methods. Specific exercises may be suggested to help retrain the muscles that support your spine. Proper rest is an important aspect of the healing process, too. Get the appropriate amount of rest your body needs and avoid sleeping on your stomach. During the healing process, proper nutrition is more important than ever. Make sure you eat balanced meals, and if you’re overweight, now would be a good time to slim down and reduce unnecessary stresses to your spine. Perhaps most important of all, keep your appointments and follow your chiropractic doctor’s recommendations for optimum results. Since significant spinal trauma can occur at birth, many parents have their newborns checked for the Vertebral Subluxation Complex. Later, learning to walk, ride a bicycle, and other childhood activities can cause spinal problem. While a bandage and some comforting words can help a skinned knee, the unseen damage to the child’s spine is the unique domain of a chiropractic doctor. Many childhood health complaints that are brushed off as “growing pains” can often be traced to the spine. Regular chiropractic checkups can identify these problems and help avoid many of the health complaints seen later in adults. Naturally, chiropractic adjusting procedures are modified to a child’s spine. Most parents report that their children enjoy their chiropractic adjustments and seem healthier than other children. More and more people are consulting chiropractic doctors, especially in their later years. With growing concerns about over-medication and the side effects of combining various prescription drugs, safe, natural chiropractic care is growing in popularity. Restoring better spinal function can help improve mobility, vitality, endurance, and appetite. Many patients report improvement with arthritic symptoms and other chronic ailments often associated with the aging process. The adjusting technique used by your doctor will be modified for maximum comfort and results. As we get older and wiser, the simplicity and effectiveness of chiropractic care becomes more and more obvious. Spinal problems, neglected since early childhood, may require ongoing supportive care for optimum spinal function. These longstanding problems are often associated with muscle weakness, soft tissue damage, and degenerative changes to the spine. Most patients find that periodic chiropractic checkups help keep them in tip-top shape. Those who are active, have stressful jobs, or want to be their very best, find that a schedule of preventative visits are helpful in maintenance of good health. Some patients seek chiropractic care only when their ache or pain becomes unbearable. We discourage this type of care and encourage you to adopt a lifestyle of wellness. Our clinic is committed to patient education. In numerous studies, patients who fully understand their condition and their doctor’s recommendation, get well faster. 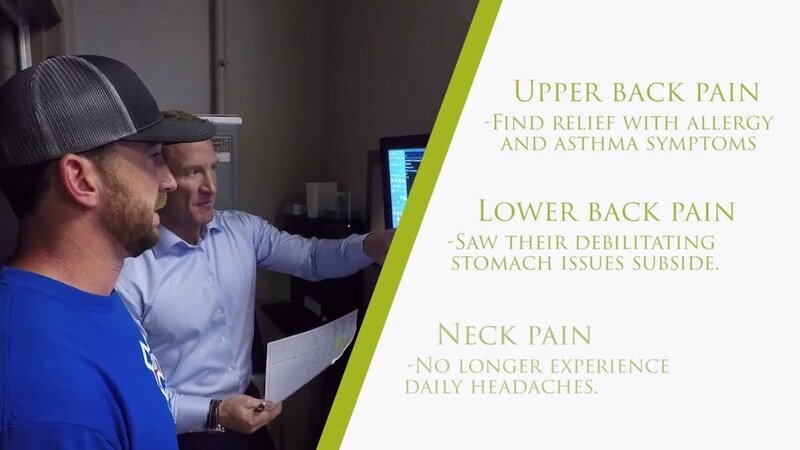 While chiropractic does not specifically treat breathing problems, digestive disorders, fatigue, menstrual pain, colic, ear infections in children and other general health problems; patients often see an improvement of symptoms of these complaints after a course of treatment involving lifestyle changes, nutritional advice and spinal correction through manipulation.